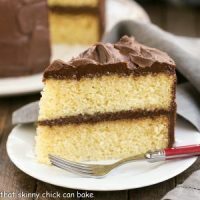 A classic combination of a fine crumb yellow cake and dreamy chocolate frosting! Perfect for any celebration! Whisk together flour, baking powder, baking soda, and salt in a medium bowl. In your stand mixer, beat butter and sugar on medium speed until pale and fluffy, then mix in vanilla. Add eggs one at a time, beating well and scraping down the bowl after each addition. Mix in buttermilk until just combined (will not be smooth). Add flour mixture in three batches, mixing until just combined. Be careful not to over-mix as this will toughen cake and cause big air bubbles. Spread batter evenly in cake pan. Drop the cake pans onto the counter from a few inches up to release any air bubbles, 2 or 3 times. Bake until a toothpick inserted into the center of cake comes out clean, 35 to 40 minutes. Cool on a wire rack for about 10 minutes, then invert, remove cakes from pan and let finish cooling. To make frosting, place the cocoa in the bowl of your stand mixer. Mix with whisk attachment to remove lumps. Add the butter and cream until smooth. Alternate the powdered sugar and milk by adding about a cup of powdered sugar and a tablespoon of milk, mixing, then repeating until all is incorporated. Add vanilla and mix to combine. You may adjust the powdered sugar and milk if you need a thicker or thinner frosting. Cake adapted from Smitten Kitchen. Frosting adapted from Add a Pinch.